Walk-in bathtubs assist people of all ages by making bathing safer and more accessible. People with walk-in tubs benefit because they don’t have to climb into or out of a wet and slippery area, risking a fall in what the Centers for Disease Control and Prevention named the most dangerous room in the house. Jacuzzi, a household name in whirlpool tubs since 1968, uses the same industry-leading safety in their walk-in tubs that you'd find in their hot tubs. Jacuzzi offers multiple models of walk-in tubs with varying features. For a look at our picks for the best walk-in tub brands click the link below. Jacuzzi keeps things simple by only offering two walk-in tub lines: the Jacuzzi Walk-In Tub and the Finestra Bathtub. The Jacuzzi Walk-In is designed to fit in the place of a standard bathtub, so it’s the perfect choice for bathroom renovations as well as for replacing existing walk-in bathtubs. Walk-in tub models feature jets to help relieve sore muscles, a guaranteed leak-proof door that opens extra wide, and their Fast Fill faucet. The Jacuzzi Walk-In Tub also comes in compact and large sizes. With a walk-in tub, you’ll no longer have to worry about balancing as you climb over the lip of your standard tub, considerably reducing the risk of falling. Built-in features like handrails, seats and textured floors add to the safety of using a bathtub. Given its background, the options that Jacuzzi offers elevates bathing from a cleaning session to a bathing experience you’d find in a spa. We sorted out the features and average price range for each of Jacuzzi’s walk-in tub models below. releases thousands of bubbles filled with warm air. The optional Aromatherapy system aids with relaxation. Both the Finestra and Jacuzzi Walk-in Tub lines come with the RapidHeat in-line heater which maintains the water temperature longer, Fast-fill and Quick Drain which fill and drain the tub two times faster than standard faucets and drains, heated seats and backrests. Both offer jets optimized for massage and both models allow for full body soaks. When you sit in a tub of hot water, you receive health benefits through passive heating. Several passive heating studies over the past few years prove that a good soak may do your body good by lowering inflammation, burning calories and more. The comfort features in a Jacuzzi walk-in tub enhance the benefits of passive heating. You may know that magnesium in Epsom salt baths helps with arthritis pain, enhanced sleep, fibromyalgia and easing sore muscles. Jacuzzi is the only walk-in tub maker that is Epsom salt compatible. Salt can clog the motor that powers air or water jets on other brands or rust out the pump or heater. Finally, the Jacuzzi Walk-In Tub and the Finestra lines offer variations to make it easy to find the walk-in tub that will fit your lifestyle and needs. We’ve included those features in the chart below. 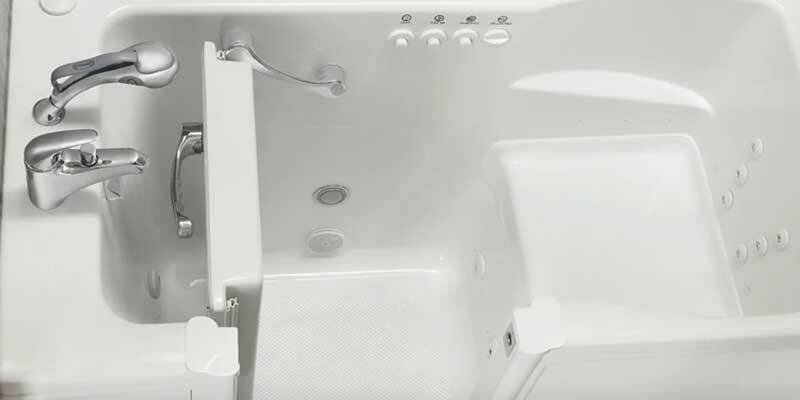 Jacuzzi doesn’t mention warranties for their walk-in tubs specifically on their website, but for reference, their whirlpool tubs come with a limited lifetime warranty. Labor is covered for one to two years depending on the model and options. Accessories are under warranty for 90 days. You can call Jacuzzi or fill out a short form on Jacuzzi’s website to set up your appointment for a free in-home consultation. Having a salesperson visit your home to take measurements accurately helps prevent you from buying a tub that won’t fit well in your bathroom. You can have all questions answered at this consultation as well, and you don’t have to order anything on the spot. When we contacted the company, the U.S.-based customer service agent who spoke with us was both kind and knowledgeable, answering all of our questions without any sales pressure. With an A- rating from the Better Business Bureau and thousands of sales, Jacuzzi has only had six complaints lodged against them in the past three years, and they have responded to each one of them. Most complaints were about walk-in tubs in general rather than Jacuzzi itself. Customers didn’t’ like how long it took to fill the tub and how expensive walk-in tubs are. Consumers on ConsumerAffairs rates Jacuzzi at 4.2 out of 5-stars with over 200 customer reviews. Customers speak positively about Jacuzzi employees, in particular, the consultants that do the free in-home estimates and the installers. Customer service agents get high marks for their after-the-sale assistance. Many agree that having a Jacuzzi walk-in tub has noticeably improved their quality of life. Does Medicare cover the cost of Jacuzzi walk-in tubs? As of July 2018, Medicaid does not cover the cost of walk-in bathtubs because they are not considered to be durable medical equipment. What are the cons of buying a Jacuzzi walk-in tub? The most prominent safety feature walk-in tubs bring to the table — the door — also has a downside because you can’t fill the tub with water before entering it, which could leave you a bit chilled. You not only have to wait for the water to get to the right level, but you could also have difficulty adjusting the temperature to fit your comfort level. Some walk-in tubs feature heated seats to help the bather stay warm while waiting for the tub to fill and drain. Jacuzzi walk-in tubs have in-line heaters to maintain the water temperature. How much water does a standard Jacuzzi walk-in tub hold? The average walk-in tub holds 50 to 55 gallons of water. While this is more than a standard tub, it’s comparable to a shower, which uses about seven gallons a minute. The built-in Jacuzzi RapidHeat in-line heater is a water-saving feature that maintains the water temperature at an average of 104 degrees. The temperature in an unheated walk-in tub drops to 98.6 in 10 minutes, requiring the bather to add more hot water to remain comfortable. The Jacuzzi Fast Drain technology drains the water in half the time it takes a standard tub to empty, which is a plus for your comfort while you wait to be able open the door. How do I determine the water heater size I will need for a Jacuzzi walk-in tub? A general rule of thumb is that the water heater should be no less than two-thirds the size of the water capacity of the tub. For example, a 60-gallon tub would require a 40-gallon water heater. We recommend that you consult a plumber to calculate precisely what size water heater you’ll need for a walk-in tub so you won’t shortchange the rest of your household while bathing. Can I control the jet power in my Jacuzzi walk-in tub? Jacuzzi makes it easy to adjust the water and air flow through a knob on the control panel. Raised push buttons also make operating the light, air, and whirlpool systems extremely easy. Does Jacuzzi have any special offers? Jacuzzi offers special pricing from time to time. At the time we published this review, the current promotion offered $1,500 in savings, special financing and low monthly payments. Where are Jacuzzi walk-in tubs manufactured? 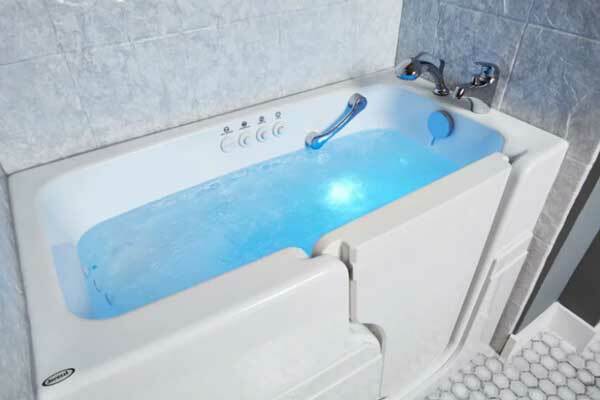 Jacuzzi manufacturers their tubs in Valdosta, Georgia so you know your tub will meet U.S. standards and license requirements. Buying a walk-in tub is an investment in your continued independent living. The Jacuzzi name has been synonymous with luxury bathing for decades, and the company continues to pioneer new technology to improve their products. While their selection may appear limited compared to our picks for the best walk-in tub brands, it’s easier to narrow down your choices from a few solid American-made tubs with various therapeutic benefits. My experience with the Jacuzzi company has been most unpleasant, If you should purchase one of their very expensive walk-in tubs and it needs repair at some point, be prepared to fix it yourself as the company has forgotten you name after the sale is made. They will refer you to incompetent repair companies and when you have problems they just wash their hands of you and suddenly nothing is covered by the warranty. The customer service is terrible and the warranty useless. I have heard that there are much better, less expensive tubs out there and I wish I had known this when I purchased my walk-in tub.